comprising of ski hats, mittens and scarves . Some of which featuring our signature multi coloured mega-poms. 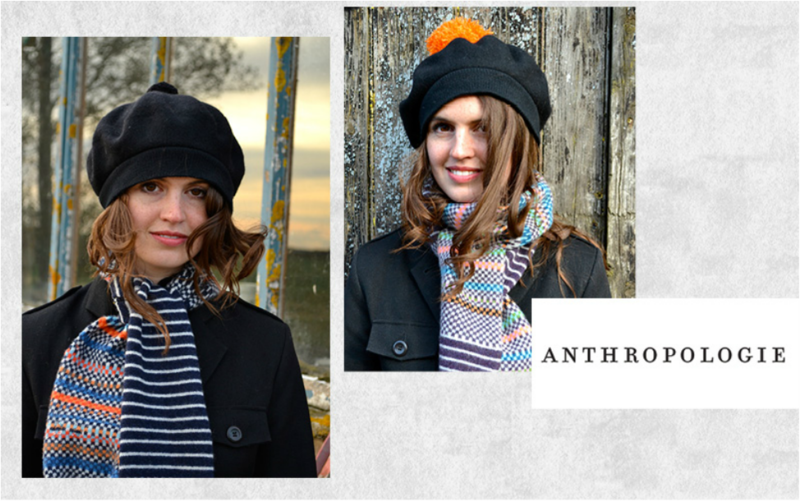 Our second Anthropologie collection commissioned around our micro jacquard and stripe design with co-ordinating mittens and gloves, was produced in 3 colour ways and sold in all Stores nationwide. 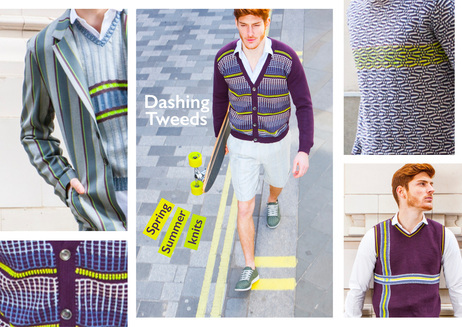 We recently completed this knitwear collection for Dashing Tweeds. It is available at their new store on Sackville St in Mayfair. We designed it to compliment their amazing suiting fabrics. The reference was English Summer sports. We got carried away inspired by retro Cricket Sweaters and 1960's half milano stitch Cardis. We used crisp linen and mercerised cotton yarns and of course that famous Dashing glow of luminous lime. Recent commissions for The Tate Enterprises, include ranges for men and women and were inspired by Gerhard Richer and British Pop Art. All products are made in the UK and contain 100% Geelong lambswool. Pictured here our geometric patterned reversible Fade - Out scarf designed for The V&A and timed to go with "Horst - Photographer of Style " exhibition .We were inspired by Horst's play with light and illusion. The gloves and a full unisex collection was commissioned for the " Constable " Exhibition. See the V&A shop for the full range. 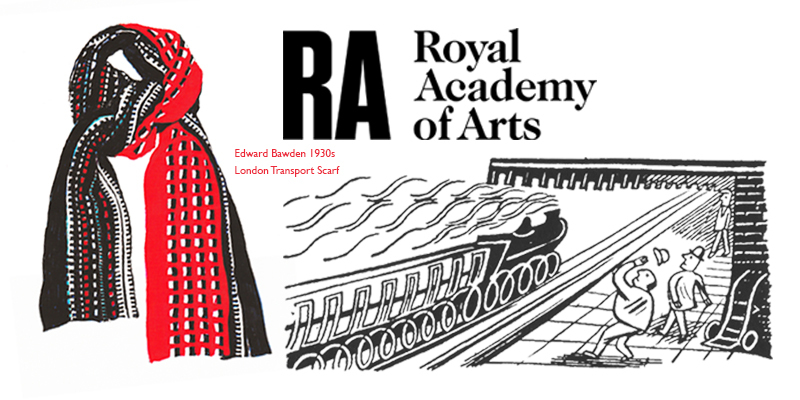 The Royal Academy of Arts commissioned us to design a special scarf to go with their Edward Bawden products. We were inspired by Bawden's posters and ephemera for London Transport from 1924 to 1952. You can buy this scarf at The Royal Academy on line shop. We are often inspired by paintings at Quinton Chadwick. Here is another scarf commission for the Royal Academy , our Barbara Rae influenced double thickness zig zag design. Still available at the RA on line store.